With every surf session we immerse ourselves in Mother Nature and enjoy the unique experience She offers us. At the same time we shouldn`t forget that every one of us is responsible for Her preservation. Kun_tiqi has made it its business to give every surfer the chance to make their own contribution by using a product which is produced from eco- friendly and sustainable materials. These are mainly balsa wood and vegetable oil-based resin. 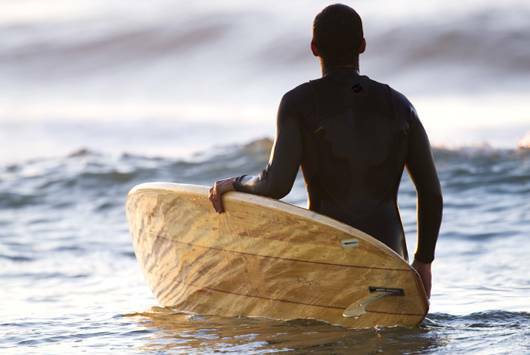 Kun_tiqi uses the latest technologies in the field of eco- friendly and sustainable raw materials whilst at the same time optimising the stability, longevity and performance of our wooden surfboards. In addition to proclaiming its message to preserve the environment, Kun_tiqi takes on its social responsibilities by paying a fair price to the producer and ensuring that proper working conditions are constantly maintained and improved. Now every surfer can fulfil their own philosophy of affinity to nature and fairness to others, by choosing a board that we are proud to produce and that you will be proud to surf.